So this is the week for vacation bible school. We have our VBS at night where most churches have theirs during the day. I love that we do ours at night. It gives the parents that work, like me, the chance to have hands on experience instead of just dropping of their children and waiting to see and hear what they have done later that night. I love VBS week. I work in the craft room and have the best time. My friend S invited me several years ago and has become a tradition that I treasure. R7 is a pro and moves from activity to activity with ease. R3, is another story. This is his first year in an actual class and he was having a little melt down last night. If he saw me, the tears started to stream and the cries echoed in the hallways. Anyway, So all week long I will be at VBS every evening from 6pm-9pm. So if I begin to ramble please for give me. 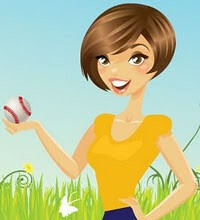 Don't forget Friday June 13th is the Spring Garden Tour hosted by Lisa, aka The Preacher's Wife.